This Stage One is now ended. Hello. This is where we began. Click on the link to see where we are NOW! Thanks! Working with public law firm Leigh Day, 999 Call for the NHS intends to bring a judicial review of plans for new local NHS and Social Care organisations to operate what they call "fixed, pre-set population budgets". This will decisively end the NHS as a comprehensive service for everyone who needs health care. Imagine that your local NHS and Social Care organisation, with little democratic accountability, instructs your doctor to deny treatments to growing numbers of patients - and you are one of them. This is already happening. It is about to get much worse. We have to challenge this. 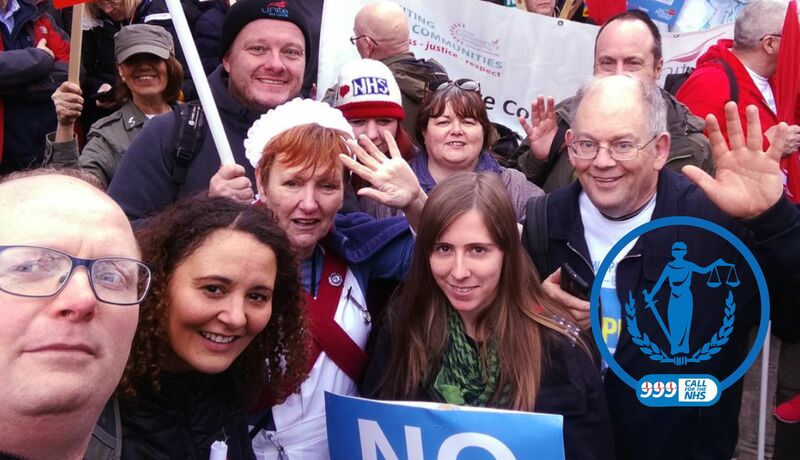 Like many others, we’re ordinary people with a passion to stop the NHS cuts and sell-offs. In 2014, with support from the public, local press and media, we marched 300 miles from Jarrow to London to save the NHS. Over 20,000 people gathered in Trafalgar Square to support this urgent call. Now the political and commercial forces attacking our NHS mean that we must march on the law courts. Leigh Day is challenging the legality of these fixed, pre-set NHS and Social Care budgets that will cover an area’s population. They are soon to be introduced through the government’s massive NHS cuts and privatisation programme, known as “Sustainability and Transformation Plans” (STPs). These budgets will be massively reduced inflexible funds and insufficient to meet the public’s needs. The result will be a limited menu of NHS treatments (just like NHS dentistry). Once our lawyers determine the grounds for a Judicial Review the next target of £25,000 should cover most of the legal costs. NOTE: Should it transpire there are no grounds to proceed to Judicial Review, in accordance with CrowdJustice's Terms and Conditions, we will donate any unused funds to another similar legal challenge, via Crowd Justice or the Access to Justice Foundation. Leigh Day are focusing on one particular Sustainability and Transformation Plan - West Yorkshire and Harrogate - on the grounds that anything unlawful in one will be unlawful in all of them. Within the West Yorkshire and Harrogate STP there is a clear intention to set up and contract local NHS and Social Care organisations to deliver their area Health & Social Care services. These “Accountable Care Organisations or Systems” would control the fixed, pre-set, population budgets. Such contracts would open the NHS and Social Care even wider to privatisation and corporate control - increasing costs, extracting profits and worsening staff working terms and conditions. This legal challenge is a big step for us and we need your help. The more we stand together, the better our chance of reclaiming our NHS. NHS FIRST- it's vital to some! Not only free at point of need,but free of profit[=less treatments].Essential. We the people have paid for our NHS, it does not belong to the government to sell, but to us to use. We are almost there! After pausing this page in May - while we developed the case with Leigh Day - we are nearly ready to launch our Stage 2 page and tell you more news about our claim to bring a Judicial Review. The last two weeks has been a flurry of getting papers ready, checking and rechecking all our documents, planning and debating how to move ahead. Thanks to everyone who is helping us - fellow campaigners, solicitors Leigh Day, the advisors at CrowdJustice and everyone who have sent us messages of support. Be on standby! Thanks for your patience and support. After a number of letters between our lawyers at Leigh Day and Calderdale Clinical Commissioning Group, they have just responded to our pre-action letter and the lawyers are now discussing next steps. We will keep you informed as soon as we know the outcome. Our lawyers, Leigh Day, are waiting for the CCG’s response to our ‘pre-action” letter. It is due in their offices before 4pm on Monday 19th June. The response we receive will then be analysed and discussed. Then we’ll know if we can get the case into the courtroom. We’ll keep you posted as soon as we know. A huge "thank you" for your support so far. We are now pushing the Clinical Commissioning Group to reply to our first letter. As expected they are playing games - treating our legal letter as a Freedom of Information request. Luckily our lawyers agreed with us that this was unacceptable and they have sent a very "pointed" letter reminding the CCG that this is a legal matter not a FOI request. We will keep you posted when we receive their response. Imagine how much more tricky they will be if we allow the Accountable Care Organisation model to go ahead? "Accountable" does not mean being answerable to us it just means accounting/money making. If you are new to the case please read below and you'll see why it is so important to everyone. Thanks for anything you can give. We appreciate every penny.